Ubuntu will work with your existing PC files, printers, cameras, music players and smartphones – and it comes with thousands of free apps. If you don’t get this menu, read the booting from the CD guide for more information. If you are connected to the internet, this should be done automatically. Check your location is correct and click ‘Forward’ to proceed. If you’re unsure of your time zone, type the name of the town you’re in or click on the map and we’ll help you find it. There is a new way to quickly search and access menu and indicator actions, called the “HUD” (Heads-Up Display). Tap the Alt key and enter some letters and words, and it will show the corresponding entries, including some fuzzy matching; then press enter to execute the action. The search will include all menu entries of the currently focused application, as well as all indicator facilities (like managing emails, sound list, or logging out of the session). It learns from your previous choices to make the search more and more accurate for you. System Settings has several new “options” to customize Unity’s look and behavior. ClickPad support requires extra handling that conflicts with “Click Action” support. Click Actions allow for separate actions when multiple fingers are active on a trackpad. 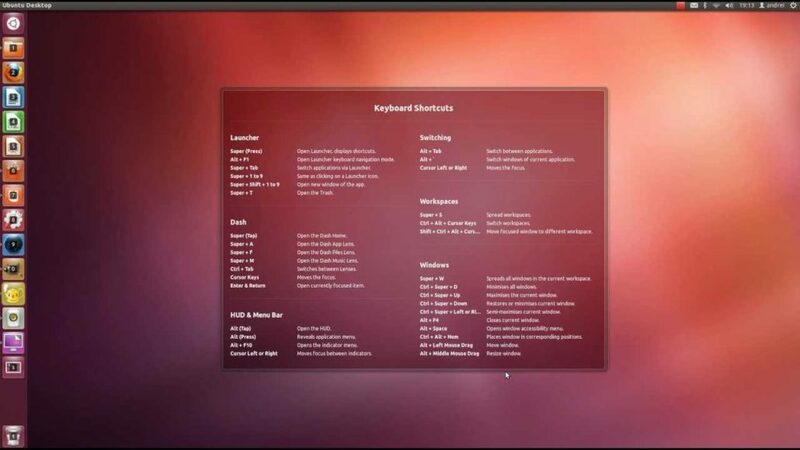 The default Ubuntu settings enable right button behavior when two fingers are in contact with the trackpad surface and the physical trackpad button is pressed. Because of conflicting behavior, ClickPad devices do not support Click Actions in this release. When installing new software through software-center, corresponding language support packages (translations, spell check modules particular to that software, help files, etc.) are now installed alongside automatically. This removes the need to open “Language Support” after installing new software. Up until Ubuntu 11.10, administrator access using the sudo tool was granted via the “admin” Unix group. In Ubuntu 12.04, administrator access will be granted via the “sudo” group. This makes Ubuntu more consistent with the upstream implementation and Debian. For compatibility purposes, the “admin” group will continue to provide sudo/administrator access in 12.04. Backports are now more easily accessible — to enable users to more easily receive new versions of software, the Ubuntu Backports repository is now enabled by default. Packages from backports will not be installed by default — they must explicitly be selected in package management software. However, once installed, packages from backports will automatically be upgraded to newer versions. DVD Images — the DVD images have been cleaned up significantly reducing their size to around 1.5GB to ease consumption. The remaining software remains available via download. We’ve also conducted an extensive review of Ubuntu kernel configs and made numerous config changes as a result.